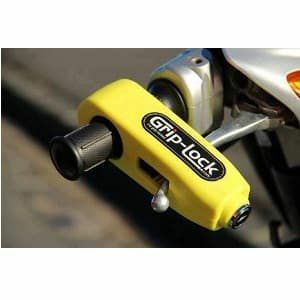 This Grip-Lock Anti theft motorcycle device, in Yellow, is a highly visible and a physical deterrent. By pulling and holding the front brake lever back the front wheel cannot be moved and the throttle becomes inoperative. Another great advantage of the Grip-Lock system is that the owner cannot forget this security product is in place, unlike a disc lock, and attempt to ride off.